A top producer of horse feeds since 1982, Ocala Breeders Feed & Supply provides our customers with the highest quality in the marketplace. We maintain our steadfast commitment to customer service by producing both textured and pelleted horse feeds that are well-formulated, fully fortified and incredibly fresh. The vision began in the early 1980s when shareholders of co-op owned Ocala Breeders’ Sales Company launched Ocala Breeders’ Feed and Supply. Initially, we purchased feed from satellite mills and distributed to customers in Marion County, Florida. However, by 1983 we constructed a dedicated horse feed production plant. 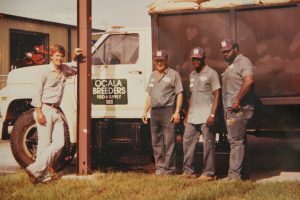 Ocala Breeders’ Feed and Supply was beginning to have a formidable presence in the Florida horse feed industry. Top quality food-grade grains and ingredients arrive at the mill by rail car and over the road shipping methods. Textured and pelleted oat based horse feeds are then produced from these top quality ingredients. Dedication to least cost formulations ensures production of consistent, drug-free products, that suit a variety of horse nutritional needs. More than formulas and ingredients make our feeds top quality. Quality control and housekeeping meet and exceed industry requirements. We monitor Floor inventory daily, and adjust production accordingly to ensure customers receive locally milled, daily freshness in OBFS Feeds. We have two retail locations in Ocala, FL and dealers stock our feed in surrounding counties. In addition to the OBFS horse feed line, we offer a large selection of grains, additional lines of horse, livestock, aviary, and pet feeds in stock. We have top quality hay and hay cubes, bedding, and livestock equipment. Our stores also have a variety of animal health products, tack, grooming supplies, and much more. 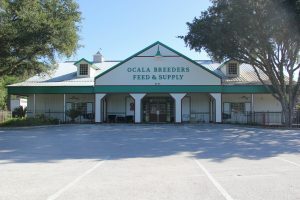 Ocala Breeders’ Feed and Supply strives to provide a knowledgeable, friendly staff that knows customers by name! Although we have grown over the years, a steadfast commitment to customer service remains. Product lines that meet the needs of our clientele make OBFS your one stop shop for your farm and pet needs.